SYNOPSIS (Courtesy of IMDb): Allan Gray, a traveler obsessed with the supernatural visits an old inn and finds evidence of vampires. Strengths & Weaknesses: Most horror has to do with losing your life, or trying not to. At its best, Vampyr jumps into the (for me) scarier territory of losing your mind (and maybe your life too). The characterization is threadbare, and the story is run-of-the-mill, but the macabre atmosphere and visuals induce a perfect sense of dread. It’s an uneven film in which spurts of genus are followed by stretches of perfunctory storytelling. The middle section moves briskly enough but doesn’t have much to offer beyond exposition and standard-issue vampire business. But then things pick back up when Dreyer returns to playing with our minds and exploiting the hallucinatory power of film imagery. Although it’s technically a talkie, the style is entirely that of a silent film, and the dribbles of dialogue contribute little. (It was dubbed in German and French after filming completed.) The silent lineage can be seen in the reliance on explanatory titles and sustained reading of book pages. The music is strong, though, and there’s one thrillingly creepy use of sound (see below). Comparisons: F.W. Murnau’s Nosferatu, which I watched on the sixth day of this marathon, is an obvious point of reference — another German vampire film from a directing great. There are a number of great moments in Nosferatu, and Max Shreck gives a shockingly creepy performance that has no equal in Vampyr (or, really, anywhere). In that sense, Vampyr‘s closer cousin might be The Cabinet of Dr. Caligari, which is similarly interested in disorientation and madness as much as mortal danger. 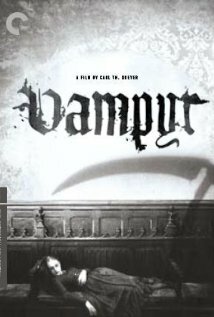 The effects there are achieved with trippy, surrealist sets that could work well on a stage, whereas Vampyr is a purely cinematic experience (and better for it, in my opinion). There’s a mind-bending aspect to Caligari that’s very satisfying, but it’s achieved narratively, through a brilliant framing device. Brilliant is not a word that you’d use to describe Vampyr‘s narrative. But Murnau’s approach is very straight-forward — a depiction of madness, not a descent into it. Dreyer’s aim is more audacious: he wants to push the medium and mess with your head. Then there’s The Passion of Joan of Arc. So different on the surface that it’s hard to believe they were fathered by the same director. But a closer look reveals the family resemblance, including a fascination with machinery and a love of vertiginous, plunging angles. Although Vampyr never achieves the sublime power of Passion (and is barely on the same planet in terms of acting), it shares the same inventiveness and audacity. Characters/Performances: Nicolas de Gunzburg agreed to fund the film in exchange for playing the hero, and that money is exactly what he brings to the role. An actor so wooden than when he plays a corpse it seems like type casting. It hardly matters, though, because Dreyer and his cinematographer, Rudolph Maté, are the real stars of the film. Best Moment: We begin with some nice creepiness on the night of Gray’s arrival at his inn, but the real fun starts the following day. As Gray explores his environment, Dreyer lays on a sequence of rewind-worthy images that make wonderful use of shadows and off-kilter perspective. At moments, he violates Gray’s viewpoint, showing us things that seem to be what Gray sees — but that can’t be. For instance, having Gray “see” a hand on a banister, then subtly revealing that Gray’s perspective wouldn’t have allowed him to see the hand. For all I know, Dreyer just made a mistake and decided to leave it in, but the effect is very cool, whether intentional or not. It compounds our sense of disorientation — that this is a dream landscape where viewpoints can’t be trusted. The best moments, though, come in the second half. Gray has what could be called an out-of-body experience. (Whether it’s a dream-self or a ghost-self is an interesting question.) First, Dreyer makes Nicolas de Gunzburg transparent, which counts as addition by subtraction — and a striking effect for 1932. Then Gray discovers his own corpse and looks out as he’s sealed inside a coffin. The rest of the sound cuts out here, and we have only the ominous squeaking of the screws. And then the best sequence in the film: the corpse’s perspective as it’s carried to the cemetery. It’s more than a great use of camera work — it’s also a sadly haunting evocation of death. I won’t be forgetting it. Exceeded my expectations — definitely check it out if you can.